It's that time of year again-- I think we can officially say its "Holiday Season," here in the US. (I know, I know... I saw a Christmas-themed ad for an ubiquitous, coffee shop the day after Halloween, but it felt like a complete farce to see snow and peacoats in the face of our beautiful, temperate November weather.) And this week is the annual gluttony fest that we all know and love - Thanksgiving. Every year, wine writers seem to bend over backwards to put a new spin on that tired trope of what wines to drink with the meal. If you've been in the game of reading about wine for any amount of time, you can probably guess the few that will be trotted out-- the old standards being Pinot Noir and Zinfandel. If you're one of the trendy kids on the block, you've probably got a magnum of Beaujolais Villages stashed away for the day. Maybe a Zweigelt if you're feeling extra punchy. Yeah, yeah, these are all good options, but you know what? It doesn't really matter what you choose to drink for Thanksgiving. Regardless of the origins of the holiday, I'm pretty down with the white-washed, grade-school level best sentiments. It's easy to forget to be grateful for the good things in our lives, and I think there's a lot of value in openly stating what we're thankful for. As for me, I'm just happy to be able to sit down and share conversation and nourishment with my loved ones. And that's more important than any bottle of wine. We brought in 75 tons this year - less than the past two years, but a nice manageable number of tons. 25% of that became white wine, 10% went to rose, and the remaining 65% was red. And fun fact about the white wine -- that was entirely estate fruit! Get ready for Sauvignon Blanc, Viognier, and Malvasia Bianca from Turkey Creek. The length of the harvest was just about the same as in years past, but started a bit earlier than last year. I'd say from a picking perspective, this year was more challenging in years past-- we wound up dodging the monsoons a bit more during red season than we typically do, and had to postpone a few picks due to vines taking up too much water and diluting the fruit. And as for the whites, we picked the Viognier earlier than we typically would due to sunburn. That's right - fruit can get sunburned just like humans. One of the most exciting aspects of the vintage, for me, was that we got our cellar centrifuge up and running. I'll be doing a longer post on this, but what this means is that we were able to improve our yields quite a bit and free up much needed fermentation tank space much more quickly than we have in the past few harvests. In subsequent years when we're back up to higher incoming tonnage, this will be a huge boon to us. I can't wait to keep using it. Welcome back, everyone, to our primer on wine color! Last week we talked white and rose, and this week we're going to talk red and "orange." We know that red wines get their color from the skins of grapes, but here's the trick: during fermentation, the skins rise to the top of the fermenting liquid, so in order to extract the color in the skins, we somehow have to get them back into contact with the liquid. This is where punchdowns and pumpovers come in. These are the methods we use here at Aridus. Punchdowns literally involve pushing the grape skins back down into the fermenting liquid. We use a tool that looks like a giant plunger, which I'll feature in an upcoming "Favorite Tools," post. Pumping over is just like it sounds-- we hook up a pump to the bottom of the tank, and use a pump to move the fermenting liquid over the top, where it's sprayed all over the skins either by hand, or through a device that spins and gently disperses the liquid. I'll feature this in an upcoming post, as well. A few other alternative methods of dealing with skin contact during fermentation are available to winemakers. One is the use of rotary fermenters, which literally turn and in doing so, mix up the liquid and skins. Of course, this requires a specialized tank that is set on rotating gears. 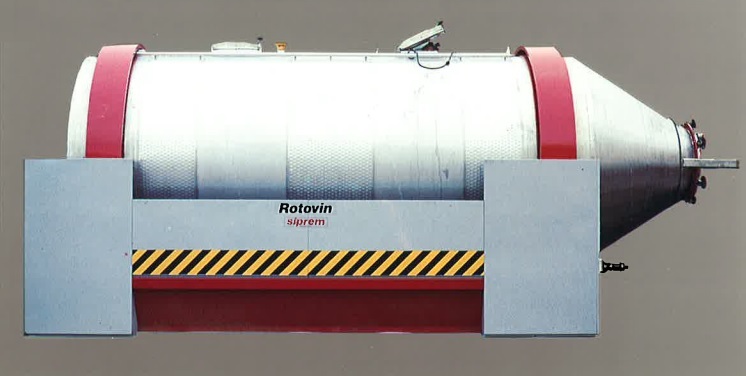 The most common places to see rotary fermenters are in medium to large wineries in Australia. They've generally fallen out of favor due to the perception that they produce an overly tannic wine, but as with all tools, it's how you use them that matters. Another option is delestage, which has the potential to be the most gental of all options for skin contact. This involves draining the fermenting liquid from the tank completely, leaving just the skins behind. Once the tank is fully drained, the fermenting liquid is then returned to the tank on top of the skins. This method is similar to a pumpover, but in certain wineries, it's possible to eliminate the use of pumps entirely, draining the tank via gravity, and using a forklift, emptying the liquid back into the tank using gravity once again. One of the more interesting inventions in the wine world for color extraction is auto-vinification, which is used widely in port production. Since gas is also a byproduct of fermentation, auto-vinification utilizes the pressure of the CO2 that is generated to push the fermenting liquid up and over the top of the cap. During the height of fermentation, this can mean an almost near-constant pump over action, which is great for port producers who are looking for lots of color extraction over a short period of time. Finally, we've got "orange" wines. What are these? In essence, they're white wines produced in the same manner as red wines. Depending on the variety of grape, this could result in a wine that does indeed have an orange hue. However, there are many white grape varieties that do not have highly pigmented color compounds in the skins, and so the wine remaind a yellow or golden color. A more accurate term for these wines would probably be "skin contact whites," and they can be made using any of the methods discussed above. These are a relatively small portion of the market, and as you can imagine, they vary in flavor, texture, and color just as much as any red wine does from another. In fact, this is a very old style of wine, and the tradition of making white wines in this way has continued unbroked for thousands of years in regions like Georgia (the country), and parts of East and Central Europe. We have a skin contact white available in the tasting room-- it's our Orange Muscat, and it's one of my personal favorites. It's not sweet, and it's not as floral as your typical Muscat-- the skin contact allows for other complex flavors and aromas to develop. I like the peachy, tea-like aromas and flavors that I get on it. Stop by and try it if your interest is piqued! Where do colors in wines come from? It seems like an easy question to answer, but the fact of the matter is a bit more complicated than it would initially appear. Today we'll focus on the color in white and rose wines, and next week delve into the intricacies of red wine and the ever elusive orange wine. First of all, the color of a wine is almost entirely derived from color compounds in the skins of the grapes called anthocyanins. (There is a small family of grapes with red-colored flesh called teinturier grapes, but only a small percentage of red wines in the world are made from these.) Anthocyanins are responsible for the colors of a wide range of fruits and vegetables, and can actually have different hues depending on the pH of the item -- at wine pH most of the anothocyanins present are colorless, but a small percentage are red, blue, or purple in color, and these are responsible for the color of the wine. White wines typically are made from grapes that have very little pigment to their skins, and they are very limited in the amount of skin contact that they receive so as not to pick up too many anthocyanins from the skins. For example, grapes like Pinot Gris (see photo below) and Gewurztraminer are actually a pinkish hue, but the wines that are made from them are white because of the limited skin contact that they receive. Rose wines are typically made in the same way that white wines are, with limited skin contact, but they will often receive a short period of maceration time on skins (typically just a few hours, but occasionally up to a few days - see graphic below) to pick up just enough color to produce the pink hue so many of us are so fond of. These are also made from grapes that have the potential to produce red wines, as the concentration of color in pinkish colored grapes generally isn't enough to produce the sort of color you'd want or expect from a rose wine. Stay tuned next week for more info on wine color! Hello everyone! As I'm sure you're all aware, Vintage 2018 is just around the corner! I was out at the vineyard two weeks ago to check out how the whites are coming along, and maes sure everything's on track with establishing the Cabernet Sauvignon that was planted last year. I'm pleased to say, everything is looking in fantastic condition. A HUGE shout out to our new vineyard crew (we'll have bios of them coming up soon)! As many of you know, last year was our first crop from the white side of the vineyard. Thanks to some creative picking on the part of our former crew, it will be coming to you soon as our 2017 Field Blend-- a light, refreshing wine reminiscent of Portugal's Vinho Verde. We put it in bottle just last week, and my god is it decious. I'm so sorry that it isn't released yet, because it's my summer sipper hands down. We're just waiting on labels, but we'll try to get it into your hands as soon as possible. In the meantime... as of two weeks ago, the grapes were not yet at veraison, but we did have fairly decent and even fruit set with just a bit of shatter (loose clusters with scant berries) on one of our Sauvignon Blanc clones. We have three different clones of SB out in the vineyard, and they each have a slightly different flowering, fruiting and ripening cycle. The shatter is likely a result of a wind event during flowering. The rest of the fruit is coming along nicely, though. I'm heading out to the vineyard again today-- I expect to find that we're fully into veraison by now, so that means it's just a few more weeks before we start bringing fruit in. This year, the only whites we're producing will be off our own vineyard. Get ready for Turkey Creek Sauvignon Blanc, Viognier, and Malvasia Bianca! A row with the Chiricahua foothills in the background. A nice looking cluster. Note that the shoot is beginning to lignify (turn woody). Does anybody know what this insect is? Please e-mail me if you do! I think it's maybe a Filigree Skimmer, but I'm not sure! It may be a controversial statement, but I will take a glass of Syrah over Cabernet Sauvignon any day of the week. What can I say? Your typical Cab delivers exactly what you'd expect from it, but Syrahs tend to surprise me more. Lucky me-- Syrah tends to grow well here in Arizona, and they are some of my favorite wines from the area. Syrah probably originates just east of the Northern Rhone Valley in France, as it is the offspring of the relatively obscure varieties Mondeuse Blanche and Dureza, both of which have been grown in the Isere region where a natural cross begat Syrah. And in an interesting turn of a few events, this also makes Pinot Noir the great-grandparent of Syrah, and Viognier likely Syrah's half sibling (the family tree is a little more murky on the Viognier side). Syrah tends to be a quick-ripening variety, which is actually lucky for us here in Arizona, because we want sugars and tannins to ripen at approximately the same rate, so a grape with speedy tannin ripening is a blessing. Syrah also tends to have soft, plush tannins, which makes it a very approachable wine early on. I love really peppery versions of the wine, but I also appreciate the wild gaminess and ripe to jammy berry notes that Syrah can exhibit. Even in the dead heat of summer, I can't turn down a Syrah. Wine Ingredients - Dirt and Plastic? Hi everyone! Today I'm here to talk about two of the strangest things that are pretty typically added to wines - a clay called Bentonite, and a resious polymer called PVPP, or Polyvinylpolypyrrolidone if you're fancy. Why would we want to add dirt and plastic to wine, you wonder? My gosh, that's an excellent question. I'll start with bentonite-- at its most basic, it's a negatively-charged clay from Wyoming that swells to sevel times its dry size when wet. Because of this, when it's added to solution it has a very high surface area. It's the high surface area and the negative charge that we're taking advantage of when we use it in winemaking. Believe it or not, grapes contain protein, and when these proteins remain present in the wines made from the grapes. These proteins have a positive charge. End of story if that protein stayed stable in the wine, but unfortunately, protein tends to clump up after a certain amount of time passes, and it can form an unattractive haze in the bottle. It's much more noticeable in white wines than in reds, but certain light red wines may deposit a notable protein haze as well. How do we get rid of it? When we add bentonite into a wine and mix it up, the clay and the proteins will be attracted to one another due to their opposite charges (negative and positive), so the bentonite works to pull the protein out of the wine before it's put into bottle. We'll move the wine off that layer of clay and protein, so none of it is actually carried over into your glass. Don't worry-- you're not going to be drinking any dirt. And what about PVPP? Well, this polymer is similar to bentonite in that we use it to remove undesirable compounds from the wine. It also swells up in water, increasing surface area, but we're not looking to remove proteins in this case, but polyphenols. Polyphenols are wide range of compounds, and they can do everything from causing certain white wines to turn a pinkish or brownish color, to just making a wine taste too bitter. When we add PVPP, we're doing it in exactly the same way as bentonite - swelling in water, mixing with the wine, and letting it settle out before moving the wine off the sediment. So the next time you're enjoying a crystal clear white wine, give a little cheer to bentonite and PVPP, two ingredients that just might be the unsung heroes in producing that glass. Well, it's finally here - the season we've all been waiting for... MELTING TRASHCAN SEASON! (Or as it's known to the non-Arizona portion of the country, Summer.) And that begs the question, what are you doing to beat the heat? I know for my part, I'm busy drinking as much cold white wine in the pool as possible. I've even been known to test out nearly any bottle for it's "Spritz-ability Index," aka, how good it tastes when mixed with seltzer. I have no shame about it. When you can bake cookies on the hood of a car, and touching your sealtbelt results in 3rd degree burns, there's no room for judgement. But OH-HO, what's this? Anyone who lives here knows that it's still hot in September, so here's your bonus sneak preview release... On September 14th, get ready for our 2016 Montepulciano!